$35 a month pays for a child in Layaye, Haiti to go to high school, get an education, and prepare for a lifetime of opportunities! The World Bank defines Haiti as not only the poorest county in the Americas but also the poorest county in the world. This position comes largely from historical marginalization, political strife, and disaster vulnerability. While it seems worlds away, Haiti is only 600 miles off the Florida coast. Layaye residents live a spiritual, happy life with strong family values. Factors beyond their control limit their capacity to live the lives they strive for, especially lack of access to affordable education. With your support, we also will provide local, affordable, and high quality education for high school students. According to residents, high school education is the most pressing concern in Layaye. Without this high school, residents are forced to leave families and farms and travel to the overcrowded, highly vulnerable, and often violent major cities. That is, if they can afford the exorbitant costs. Instead, we help provide a local, affordable, and high quality education experience that otherwise would not be possible. During my two visits to Haiti, I was struck and enriched by how resilient and happy the vast majority of the young and old Haitians remained in spite of their deepest poverty. 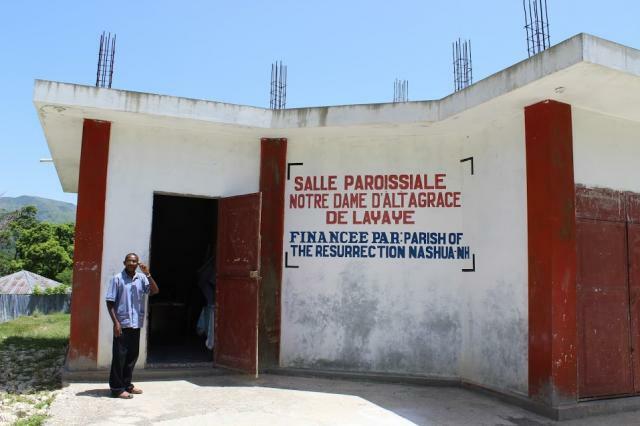 In Layaye, 75 miles northwest of Port Au Prince, the central highland of Haiti, is the Parish of Notre Dame. As part of the Parish Twinning Program of the Americas, a group of a dozen volunteers, including 8 optometrists, spent one week at this parish of 20,000 that stretched out as far as 40 miles from the church and school of Notre Dame in Layaye. During a timeout, while organizing and playing a choose-up basketball game, I had the opportunity to ask a few young adult males how we could best help their town and parish that practices open defecation, has no available clean water and homes with dirt floors and tin rooves. The surprising answer was “education”. The group conceded that little quality of life was to come for their parents, but for them and their children, they yearn for more quality education. They believe that this would lead to an improved quality of life. The lifeline for them was to complete high school in Layaye. Then, if they are fortunate, go to college in Hinch or Port Au Prince. Notre Dame, the high school for the parish, is in Layaye. Funding the teachers’ pay is not an option, and teaching supplies can only support Grades 7 through 10. For that reason, I am asking for your help to fund all classes from Grades 7-12. So far this year, we have raised $20,000 and need an additional $10,000 to reach that goal. During my last visit, I traveled to Hinch to speak with the Director of Education of the Diocese to which Notre Dame belongs, to ask if we could re-open Grade 10. He allowed us to open Grade 10 last year, 11th Grade this year and 12th Grade next year. Change lives in Haiti. Contact us for information on how to help.